All soaps are handmade at our 100+ year old family farm in small batches of 20 bars at a time. Ingredients are: water (most soaps contain goat's milk), vegetable, olive and coconut oils & sodium hydroxide with added essential or fragrance oils, herbs, spices, botanicals. We make over 65 different soaps. 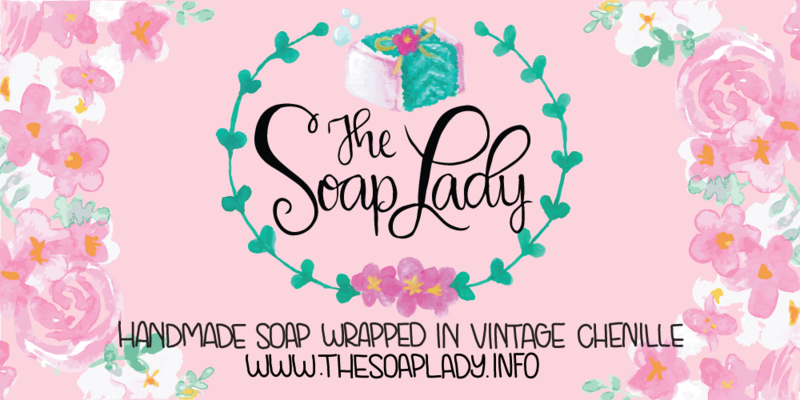 All large bars are wrapped in vintage chenille w/raffia & silk flowers & are approximately 5 to 6 ounces-much larger than most handmade soap. All of our soaps lather up great, and last unbelievably long. We share our new products, venues we will be at, and give aways! Charcoal Rosemary- Activated Charcoal pulls toxins from the pores, and Rosemary Essential Oil is a natural antiseptic. Great facial soap, but can be used all over. Grapefruit Ginger- Fresh & Citrus -Way more than the sum of these two fragrances! Hibiscus-A Floral that is not too Flowery! Hippie Chick-Earthy/Musky for all you hippies! Pumpkin Spice– Pumpkin Spice Fragrance Oil & Cinnamon Spice-Said to be Alluring to Men! Rose – Rose Fragrance Oil & Red Rose Petals-Pink Color-Reminds You of Grandma!